In his 1932 pamphlet entitled “The Disappearing City” and in subsequent writings, Frank Lloyd Wright proposed the creation of a utopian social environment that was neither urban nor rural, but a sprawling settlement of one-acre plots inhabited by families self-sufficient as farmers and artisans and bound together by, of all things, the growing ownership of private automobiles and trucks. It is easy to imagine that this vision arose out of a sense of revulsion for the growing concentration of humanity in the world’s major cities, often in conditions of intense poverty, coupled with a romanticism about the wide-open American landscape and its potential for purifying its citizenry. “The Disappearing City” attempted to proscribe urban overcrowding by advocating a return to a form of village life, not suburbia as we came know it. In 2006, when I decided to name an exhibition of my photographs “The Disappearing City,” I was not aware of Wright’s pamphlet or its subject matter, and yet I feel today that I was looking at the city through the opposite end of the same temporal telescope. Many of the great urban areas of the developing world and some of the developed world are, as Wright described Depression-era American cities, ugly, congested, polluted, and economically mismanaged. Even in North America and Europe, where immense strides have been made to eradicate the grinding poverty of a century ago, we have what Wright called “the inhuman vertical city,” in which urban densification is driven by a complex interaction between residential and commercial development, the eternal desire of urban dwellers to find and afford safe, clean habitation close to city centres, and the fallout from over-reliance on the automobile and underdevelopment of public transit, especially in North America. There are two large scale processes at work which define the structure and visual appearance of a city like Toronto, which is absorbing annually tens of thousands of new residents, many of them immigrants: One is the continuing growth of the suburbs, albeit with slightly increasing density, which are now beginning to merge with Toronto’s exurbias (which resemble Wright’s vision of the urban future). Second is the suburbanization of urban life in many parts of the city proper. The hallmark of this suburbanization is the disappearance of mixed-use areas of the city which were the economic foundation and social skeleton of the urban neighbourhood. The defining characteristic of the suburb is not a particular form of residential housing but homogeneity, and without the mixed-use environments that characterized our cities for much of the twentieth century, the urban neighbourhood as we knew it is an endangered species. I grew up in Montreal in the 1950s and 60s, in Ville St. Laurent, an old French-Canadian, slightly suburban neighbourhood, and attended school in Outremont, an established French and immigrant part of the city. As a teenager, I loved roaming around downtown, and during my last year at McGill University I lived just off St. Catherine Street. When I began the serious pursuit of architectural photography in 1984, though living in Toronto, I returned repeatedly to Montreal to try to capture those parts of that wonderful city that were old when I was young (not unlike Atget roaming around Paris before World War One). I have tried to do the same in Toronto where, unfortunately, the stock of older buildings was much smaller to begin with and has diminished even more rapidly. Scenes reclaimed from a mid-century urban childhood: the weathered doors and sagging stoops of ancient storefronts, the maze of gleaming silver of street-corner industrial plants, the chiaroscuro of late afternoon sun raking across the facades of factories, the infinite, heart-breaking beauty of time-worn brick, the shadows cast by looming octopus-armed electric standards. Those streetscapes are almost all gone; those that survive are often in the poorest sections of the city. If it wasn’t for condo-ization, there would be no factory structures left within the city core. With the disappearance of complex local mini-economies within the urban environment, often all that remains of the neighbourhood fabric is the local school. New neighbourhoods that are springing up on Toronto’s downtown “brownlands” are vast aggregates of condominium towers and stacked townhouses, urban in density but suburban in character because of their numbing homogeneity, evoking the lines of Malvina Reynold’s famous 1962 song, which was a critique of the conformity of suburban life: “Little boxes on the hillside, little boxes made of ticky-tacky…a green one, and a pink one, and a blue one and a yellow one…and they all look just the same.” And everywhere the pervasiveness of multi-national corporations; unlike the English “local,” there is nothing local about your local Starbucks or Burger King. A brand is not a place, and how will neighbourhoods grow in new urban areas where people have no economic or social ties? 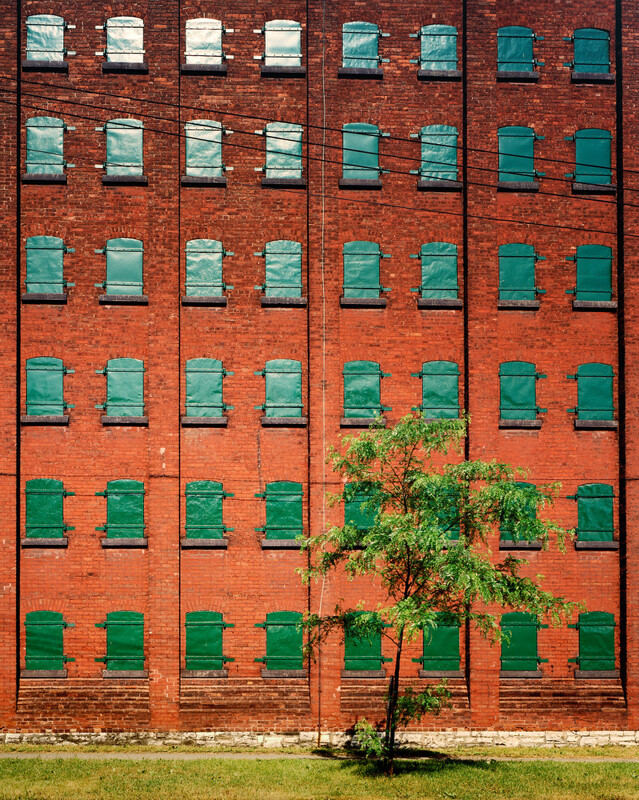 These photographs, then, are a plea for preservation, not just of buildings that merit a heritage designation, but also of structures that have no particular economic or aesthetic value but contribute to the quality and variety of streetscapes. We need to think small, even in the downtown parts of the city. We need to resist the intense economic pressure for densification that results in thirty story condominium towers that pack more and more people into smaller and smaller spaces. All these things are connected. As a photographer concerned about architectural history, facing the explosion of the new in Toronto and growing visual sameness, I feel there is less and less to photograph. This is a loss not just for me, but for all the residents of this city as they speed towards an anonymous future in which little remains of our material past.